Buddy begs us to throw mice and birds into the tree which he then hunts for relentlessly, fetches and repeats. 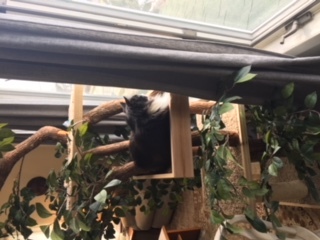 During the day, the perch is his favorite spot to nap (and to patrol the back yard). 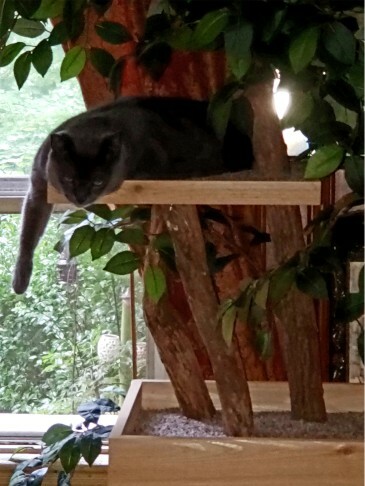 His little sister, Minnie, also enjoys time in the tree scratching, playing and napping (sometimes at the same time in the top of the tree...it gets tight up there!). They love it! It arrived a few days ago and it is so cute! The quality is better than I thought it would be, very sturdy. Will definitely be buying a few more in the future. Thanks! Here is a bonus picture of cricket, she now owns the cat tree. Generally she is so shy that when we walk through the room she runs and hides on the back porch. She is very friendly but only when we are sitting on the couch. 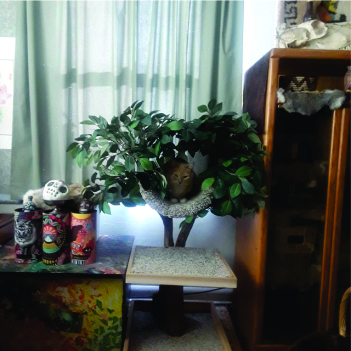 Now she just hangs out in the tree and we can move around the room with out her freaking out. The treehouse arrived today and is even more impressive than online. It's perfect. Sydney of course has staked claim to the tree top. Bitty hasn't gotten off it since it arrived. I can not tell you how much I, and they, love it. I hope that you and your lil babies are doing great! We are doing fantastic here!! Thanks to you both!! The new bit and nails along with the better impact tool I ordered WORKED OUT GREAT!!! It all came together so smoothly!! Thank you both SO MUCH!! They ARE BEAUTIFUL!!! I really love them. They look perfect and elegant in the living room!! As you can see in the photos, Chip and Dale are in their glory! They are sound asleep on them! Chip is on the beanpole and Dale is on the second tier of the deluxe! I am thrilled that I bought the two and that the one has sisal! They have so many places to hide away and relax and play!! It’s a wonderland for them! I’m so thrilled!! 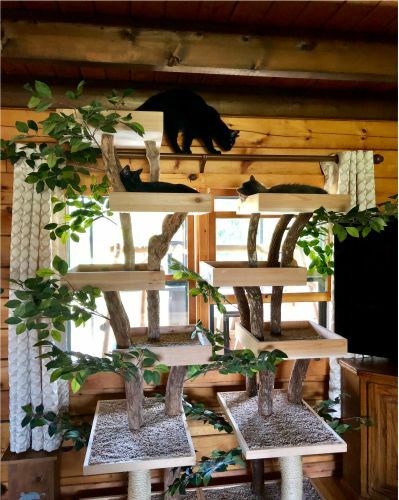 Now my boys have their own gorgeous cat cave!!! What more could they and their human ever want!! Thank you both so much for seeing me through every step of the way. That meant the world to me. You don’t just sell something exquisite, you make sure your customers have the complete satisfaction and joy of having it successfully put together at home. You are true professionals, unbelievable artists and creators, and warm and incredibly kind and loving people. God bless you both. I wish you the best of everything always! Enjoy your trip to N.Y.! Have a great time and may it be very fun and profitable!! Good speaking with you today! That's Hecate, Orion and Mira. 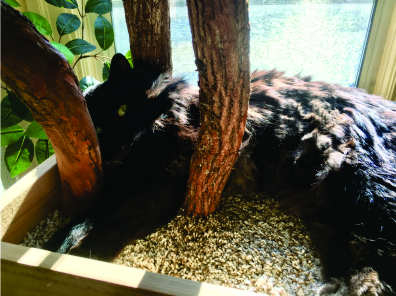 The other two cats had just jumped out the pet-door in the window (easily accessible now from the right-hand tree) onto their catio. And as you can see, Orion can do his favorite thing which is walking along the curtain rod, but now he doesn't have to climb the curtains to get there. Thanks so much for beautiful trees! 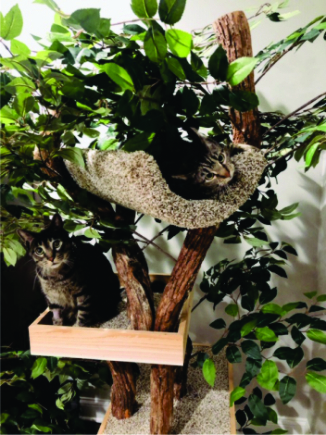 I've know Shelley and Joe for a few years - they put a fabulous two Pet Treehouses together for the famous Cat Hotel in NYC, The Algonquin. 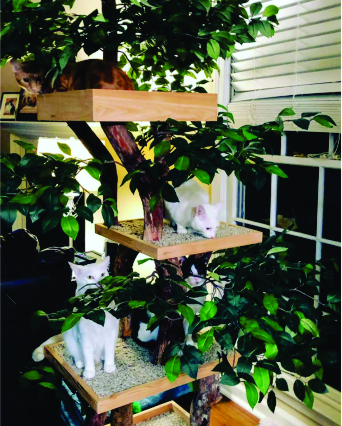 They have been huge supporters of the hotel and each year they donate one of their houses for the annual auction with 100% of all proceeds going to assist cat/dog rescue efforts with the Mayor's Alliance in NYC. 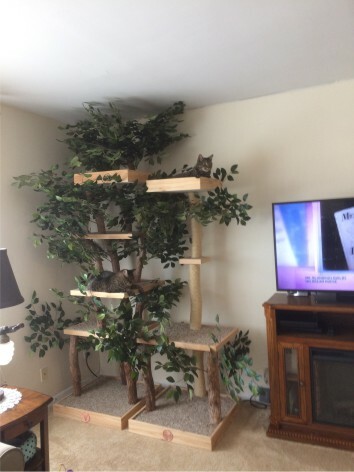 So when I adopted a cat from my local rescue, I had to spoil Sebastian with his Penthouse - Shelley and Joe went above and beyond and ensured an amazing treehouse for my "fat cat", as he is a big boy to enjoy! I can't say enough great things about them!!! 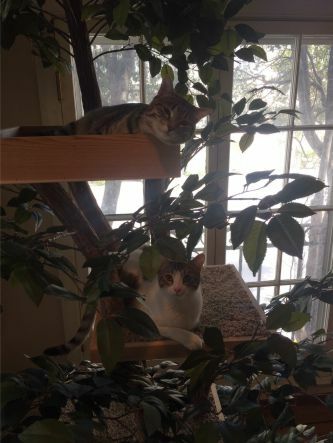 Our kitties (Kit Kat and Lulu) absolutely adore their new tree hang out! They climb, perch, play, nap and watch the outside world from their new spot. Thank you sooo much for all of your hard work! It’s also a beautiful piece if furniture in our house!